Nirmal Rathod, a beloved member of the Fellowship of Friends, completed his task after a prolonged battle with cancer, at 10:10 a.m. on Monday, July 11, 2011. He celebrated his sixty-fifth birthday in April. Nirmal was the first Indian student to join the Fellowship. 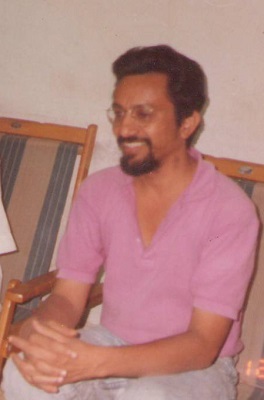 In 1987, he left Rajkot, India, and traveled to London, England, where he met and joined the School. He also met Robert who invited him to come to Apollo, which he did, and stayed for several months, working at the Lincoln Lodge (Apollo d’Oro). He was gentle and positive and his sweet, unassuming manner was often lit by a shy smile. Upon his return to Rajkot, Nirmal asked for a center to be opened in India, and the first Indian center was begun in Delhi in 1990. Later, Nirmal was a part of the newly-opened Ahmedabad Center, until 1996 when the Rajkot Center was officially started in his home city. Wait here … then return, and meet me where we always were. Dear Friend Nirmal, I will always remember our last meetings not long before you left us. Your warmth was wonderful.